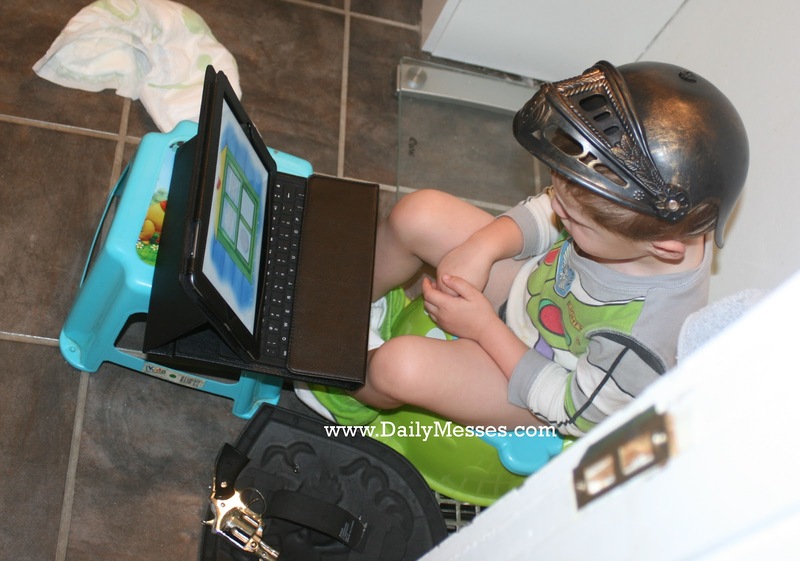 Some of you might remember my Poo-Poo Basket post, which was my first foray into potty training. The poo-poo basket and a sticker chart worked with my oldest when it came to potty training. I was hoping that it would work with the youngest. No such luck. Seriously, this kid is stubborn! 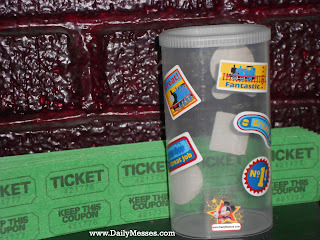 I tried the sticker chart, poo-poo basket, and bribery with M&M's. Still no luck. I then moved on to TV. He was only allowed to watch TV when he was sitting on the potty. It worked for my sister-in-law and it seemed to work for us, at least a few times. Then he got smarter than me. He began to sit on there for up to 45 minutes, claiming he was going potty, until I would make him get off. Within 5 to 10 minutes of the TV being turned off and getting a diaper back on, he would go in his diaper. I was certain that he knew he had to go. I would ask him and he would say no and then go hide to go in his diaper. We had taken him to the store to let him pick out "big boy" underwear for when he learned to go in the potty. He had Buzz and Spiderman underwear and seemed really excited about it. It still didn't work. So I next tried the underwear method. Basically, you put them in underwear instead of diapers. Diapers soak a lot of the moisture away, whereas underwear will just be wet and uncomfortable to wear. I also figured that he loved Buzz so much that he wouldn't want to pee on Buzz and have to put a "baby" diaper back on. It didn't faze him in the slightest! Buzz, Woody, Spiderman, and even Cars made sacrifices and were soiled in their efforts. I was getting frustrated. I made him go bottomless around the house. I heard it worked on some kids. Not mine. He peed on the floor and on my leather couch. So far, he was winning at the stubborn game and I was quickly running out of ideas. My mother in law mentioned using tickets. I figured, why not? I had some green carnival/raffle type of tickets in the birthday supply boxes. (Dollar stores often have these for $1 and party stores carry them as well.) 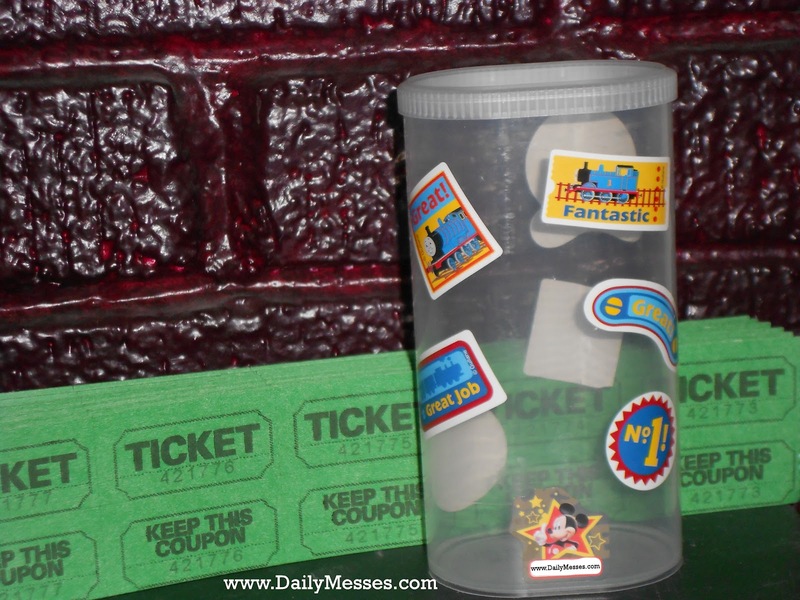 I took an empty drink mix container, removed the label, and placed some stickers around the container. I used Thomas and Cars, since he was into those at the moment. I told him every time he went in the potty, he got a ticket. Once he had "enough" tickets, he got to pick a prize. The first day, it took 7 tickets to get a prize. Why 7? He was doing really well with going in the potty and I wanted to keep dangling the proverbial carrot until the end of the day. Seven just happened to be the number of times he went that day. He picked going to the park the next day as his prize. We have several parks nearby, so he got to pick the one we went to. We kept going with the ticket method and it worked! Prizes ranged from going to the park, the zoo (we have a pass), having a movie night at home, and getting an ice cream cone. It's been a month and the ticket method seems to have worked! He mostly wears underwear, except on long car rides and at night. I have no idea why the ticket method worked when the others didn't. He just really liked putting the tickets into the container. I'm just happy that it worked! New Follower! Love ur blog too cute! I have NEVER heard of using tickets, what a great idea! As you know I recently posted about our toilet training battle and we had some success today when he FINALLY poo'd on the toilet. I think he finally just realised that the bribes were adding up and up and all he had to do to get his new undies, new shoes, 2 stickers, special lollies and a toy from the toy store, all he had to do was poo in the toilet, and he gave in! lol. Little buggers aren't they?